Thomas Francois Cartier (1879 - 1943) was born in Marseilles, France on February 21st 1879. 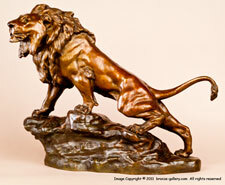 Cartier studied under Georges Gardet and specialized in animal sculpture. He created many models of Lions and other big cats and dogs especially hunting dogs. His sculptures were also used in clocks and other decorative pieces. Many were cast in white metal as well as bronze. Cartier started exhibiting his works at the Salon in 1904, continuing throughout his life. He won an Honorable Mention in the Salon of 1908 and a Gold Medal in 1927. Very little has been written about the life and works of this later period Animalier sculptor except for the listing of his exhibits.